This year, the Carriacou Regatta took place over the last weekend of July into the beginning of August. 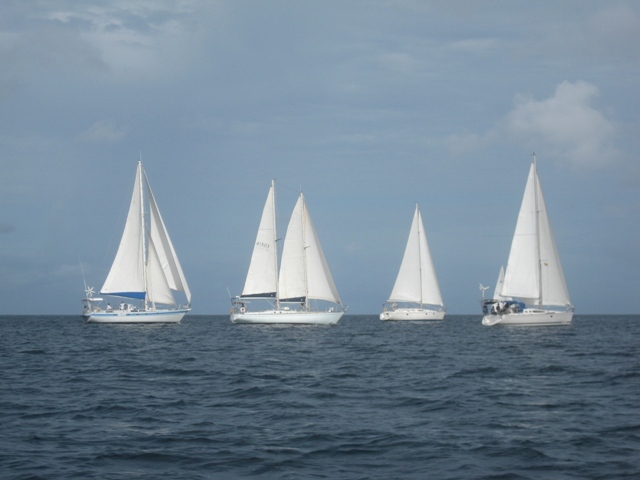 Since we just missed it last year, we decided to be in Tyrrel Bay for this year’s racing activities. Irie anchored in her usual spot close to the beach and we felt very happy to be back in this quiet, relaxed and friendly area, with decent WiFi. Once again, we were surprised with the discrepancy between the amount of anchored boats and the lack of activity on shore. Even during the regatta. We hadn’t seen our friends from SV Imagine, SV Alianna and SV Opus for at least two days, so it was time to catch up! Sam and Jon from “Imagine” signed up for the yacht races and Sim and Rosie (“Alianna”) and Mark made up the extra crew. 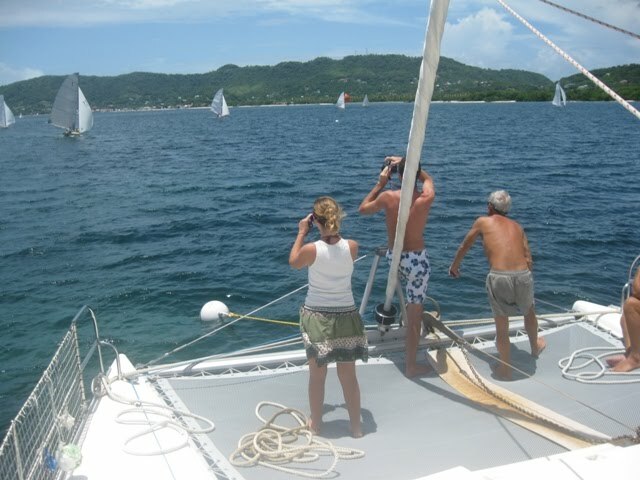 Jim from “Opus” decided to crew with the locals again in the Carriacou Work Boat class. 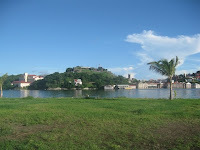 These developments resulted in a lot of activities and sights for all of us. We joined a potluck, went out for street BBQ, saw the start of Imagine’s first race, were present at a sweltering hot auction for the Carriacou Children Education Fund (for which we donated a Wirie) and listened to the final race results. 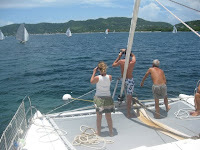 Imagine, with its great skipper and experienced crew did pretty well! 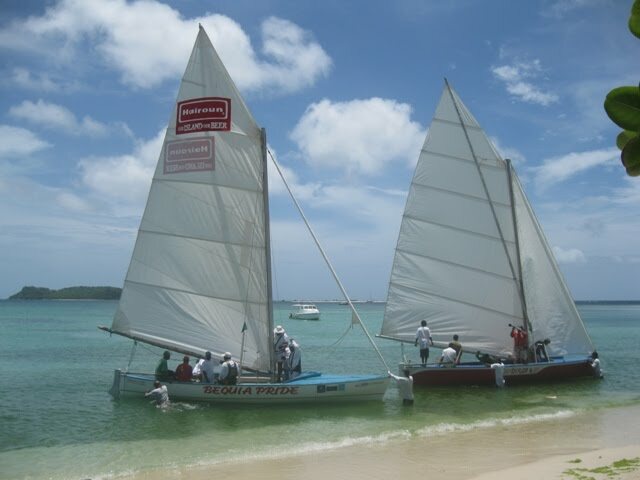 When Mark crewed his first race, Darwin and I walked over to Paradise Beach to see the launching of the work boats. From all over the Caribbean, competitors arrive. These boats don’t have engines, so they start the race by being pushed off the beach by the last person to jump in, with all sails up; an impressive sight. After the Carriacou festivities, it was time for carnival in St. George’s, the capital of Grenada. 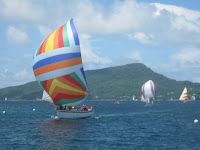 Mark and I saw a couple of parades last year and weren’t all that interested this time, but… Port Louis Marina offered great rates for a marina stay during this period. The location is pretty and convenient. We figured we could spoil ourselves once in three years and ended up staying at a dock for four nights. It was so easy to take Darwin for walks and rinse him off with fresh water. The showers are very modern and a real treat. Having our friends around in walking distance was a plus as well, with many social evenings as a result. 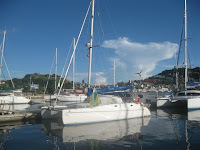 The shopping was within easy dinghy reach, the unlimited supply of fresh water made hand washing our clothes so much more enjoyable and the internet connection was reliable, providing Mark with the needs to work hard for four days. The last carnival parade took place on a superhot Tuesday August 10th. With some friends I walked over to the main watching area and managed to see most of the groups, while frying in the sun (Thanks for bringing an umbrella, Rosie) and covering our ears from the thumping, vibrating noise. 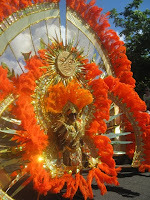 It was very similar to last year with scantly dressed women, seducing moves and just a few impressive costumes. Carnival in Grenada happens in the summer, because the competition of Trinidad in the “normal” carnival period is too overwhelming. It was a good decision to attract the crowds from the surrounding islands, but less sweat would stream and fewer headaches would be had in the more pleasant February climate. Our (temporarily) last month in Grenada will be spent in the southern bays, trying to make a few more cruisers happy with The Wirie.